I had a little more energy then yesterday but still suffered from little motivation and focus. I had a low grade headache off and on all day today. My weight went up 1 pound since yesterday, putting my total weight loss at 6.5 pounds. My face has broken out a bit. Yuck, but i am glad my body is getting rid of what it needs to. My scalp has started to itch like crazy. I slept for 7 hours last night down from 9 the night before. Also, (and this may be too much information, to the faint of heart may want to skip a head to the next section) after i went to bed, i could not get comfortable. I felt like my jammies were smothering me. I sleep in sweat pants and a hooded sweat shirts. I finally had to get up and take them off. After that, i feel right asleep. I made 2 juices today. The green one is, orange, swiss chard, carrot, kiwi, and romaine lettuce. 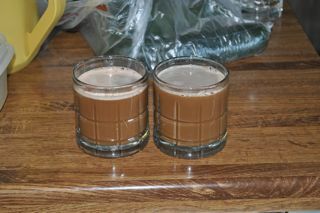 The red one is from Raw Food Made Easy For 1 or 2 People called V7 juice. However, i omitted the bell pepper because i am allergic. I also omitted the celery because we ran out. 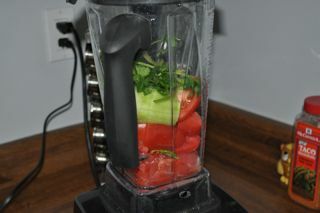 It is tomato, garlic, cucumber, jalapeno, and cilantro. The green one was liked by my mom. Lindsay said it tasted a little bland but she still sucked it down with a smile. 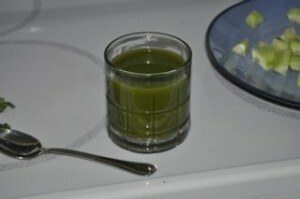 I am thinking about making more then 8oz of green juice for people in the morning. I am making it in the vitamix so i blend then i squeeze it they a nut milk bag. The red one to be tasted a bit like an acidic salsa. It got strong fast. My mom did not like it at all. I found both to taste equal. I had some fruit, 2 oranges, a banana, and an apple. 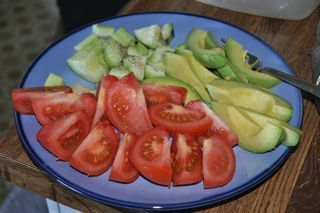 Then i made myself a cucumber, tomato, avocado plate. It really hit the spot. I ended up making myself another one of these about 2 hours later. 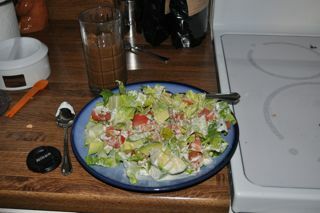 For dinner, i made ranch dressing from Raw Food Made Easy For 1 or 2 People on a romaine salad with tomato and just a little avocado (since i had already had so much of it today). Lindsay and i agreed it was very creamy but tasted more like blue cheese then ranch. Lindsay was very happy to have a familiar taste back that was not fruit. With the salad i made a strawberry, grape, spinach smoothie. It was ok, but really was too sweet. Alas, another short entry as I have have gotten such a late start. Today was the first time that I had social/business interaction where I had to say no thank you to something that I would normally say “Please sir, I want some more,” and it wasn’t as bad as I thought. I started to discuss end of the month transitions with Adrienne, since I know that my body has changed a bit. This morning I went to eat some artichoke hearts that were 90% raw and they made me sick to my stomach. I am also beginning to look at the food combinations that I eat and how my body reacts to them. Should be interesting. What is big, green, fuzzy, and if it fell out of a tree would kill you? This entry was posted on Tuesday, March 10th, 2009 at 3:39 am	and is filed under Raw Food. You can follow any responses to this entry through the RSS 2.0 feed. You can leave a response, or trackback from your own site.